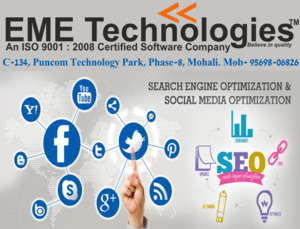 SEO is referred as Search Engine Optimization. It's basically a process through which bloggers or developers improve the visibility of website. EME Technologies believes in providing quality to students who can choose the courses according to their area of interest. In the training process the trainees get full fledged knowledge on the industrial training courses. Training gives practical as well as class room knowledge and skills. Our training improves one's capability and performance in his/her desired field.